In a rushed world of easy fixes, texting, the latest iphone, tweeting and more, sociological researchers point to the need for identity – to find a place of belonging. Rather than being lost in a mall of the sameness throughout, people are searching for a “hometown” – someplace unique, with an identity unto its own. South Miami Town Center is that place. And to celebrate our hometown, over the course of many years, a tradition of special events has developed along our “main street” for families to enjoy. Celebrations that help define who we are as a people have been part of our South Miami Town Center for decades. These popular occasions to get out and about are presented in a setting that offers an array of chic boutiques, upscale personal services establishments and great restaurants. Local businesses, the City of South Miami and other generous sponsors help to support these all-important community events. 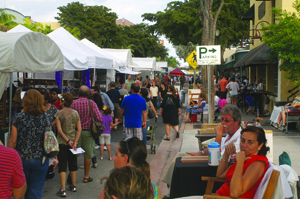 The longest running event in South Miami is the Chamber South Art Festival. Held on the first weekend in November, this juried art show features an average of 120 artists from around the country. The festival consistently draws in excess of 40,000 people and has been going strong since it was launched in 1971. For two days, Sunset Drive in our town center is converted into a promenade where you can enjoy great art, delicious food and entertainment. There are activities designed with children in mind and an “Emerging Artists” showcase at The Shops at Sunset Place featuring artwork by students from local K-12 schools. 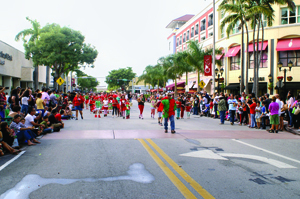 “The Holiday Spirit Starts in South Miami” with the annual Parade of the Elves. Established in 1983 by the Red/Sunset Merchants Association and now sponsored in part by the city, this child-pleasing event includes over 500 children dressed as Santa’s elves and other holiday fantasies and attracts some 5,000 on-lookers lining Sunset Drive. “This is a great parade and something that everyone looks forward to. The tradition has moved from one generation to the next, with those who participated as children now watching their children march in the parade,” said John Sorgie of Sunset Quickprint, who has worked to make the parade a success from its inception. 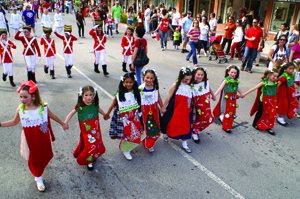 Sponsored by the City of South Miami for two decades, over 80 parade entries include local high school marching bands, Girl Scout and Brownie Troops, church groups, decorated cars and floats. From the first year and for years following, some of the prized returning entries include the South Florida Trail Riders, South Miami High School Cobras Marching Band, the Mahi Shriners, with participation from Magic City Mustang Car Club and South Miami Hospital. 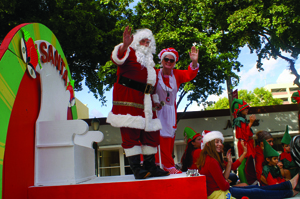 Since 1994, the First National Bank of South Miami has had the honor of presenting Santa atop a beautiful float. Santa always didn’t have a float. 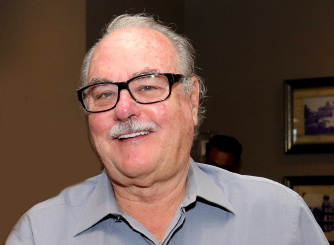 In the early years, South Miami Mayor Jack Block was Santa riding a tricycle; later parades saw Santa riding in a convertible, in a fire truck and on a decorated flat-bed truck. With parade organizer Barbara Acker’s retirement after twenty years of diligent work, a Parade Planning Committee comprised of civic and business leaders have ensured the parade tradition lives on. 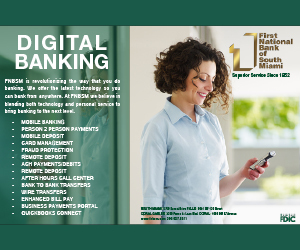 In addition to city staff, the committee includes representatives from FootWorks, the First National Bank of South Miami, Chamber South, South Miami Hospital, and SOMI Magazine. Safe Streets Halloween was begun in the mid-1980s in response to the need for a safe environment for area children to go trick or treating. 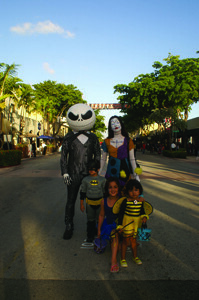 Organized by the Red/Sunset Merchants Association and with the support of the City of South Miami, Sunset Drive is closed off from US1 to Red Road from 4-6PM to create a pedestrian mall where costumed children (and adults) gather and safely roam in search of treats provided by local merchants. Association Past President Hans Huseby of FootWorks dresses up as a clown dispensing free “haircuts” to intrepid dads and children. Over the last three years, a haunted house, created and hosted at Veronica’s Doll House has been a popular addition to the event. 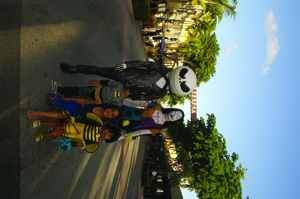 Other fun activities include a costume contest held at Splitsville, and games held at the entrance to The Shops at Sunset Place. With an audience numbering about 30,000 and 150 participants, the event includes the “Children’s Alley” with interactive and educational activities geared just for kids. Future plans include showing artwork by local school students as part of the Children’s Alley. VolksBlast continues to bring VW fans and devotees to Sunset Drive each year. 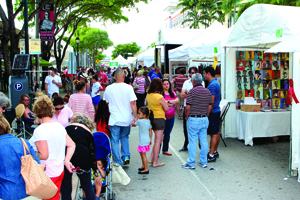 The event was first held in 1998 and hosted at the First National Bank of South Miami parking lot. It originated with VW owners desire to organize events to help raise funds for local charities. Giving back to the community, especially the ones in need, was their main focus. Many VW owners donated time as a club in helping build houses for Habitat for Humanity. Over the course of the years, VolksBlast has raised over $100,000 for different local charities. 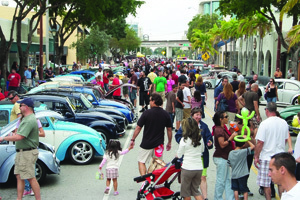 For the past several years, with support from the City of South Miami, the VW Show event has been held on Sunset Drive, with over 200 participants and an estimated 10,000 spectators. 2013 marks the end of production of the much loved and iconic Van, so expect to see many vans lining the street. The 2014 VolksBlast activities will be held on the weekend of February 7th & 8th , concluding the VW show on Sunset Drive on Sunday, February 9th. For additional information go to www.volksblast.com. Our town center business district has other events during the year which are not hosted on our main street. Summertime in South Miami kicks off with the annual Twilight 5K Run & Fitness Walk. This event grew out of FootWork’s Hans and Laurie Huseby’s desire to have a nice, neighborhood run/walk staged in their “backyard.” Another family-centered event, the race often attracts three generations of the same family that includes plenty of children. Good for cementing that community spirit, but also good for your health, the Twilight 5K has attracted the attention of homeowners along the route. Using their front lawns as hydration stations, homeowners offer runners and walkers a cool drink of water on their way to the finish line in our Town Center. The most recent run had nearly 1,400 participants who got to exercise and enjoy that friendly, small town atmosphere for which South Miami has become famous. Proceeds from the event go to benefit local charities and organizations. 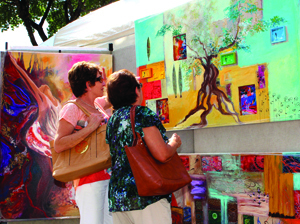 SOMIartwalk© is an event that occurs on the second Friday of each month from October through March. Unlike an art show, artwalk doesn’t require closing Sunset Drive. One can stroll through our Town Center, view the artwork on display at local shops and enjoy all that the city has to offer in the evening. Generally, some 15 separate venues participate, featuring an artist in their business. It’s an opportunity to meet established and emerging artists. 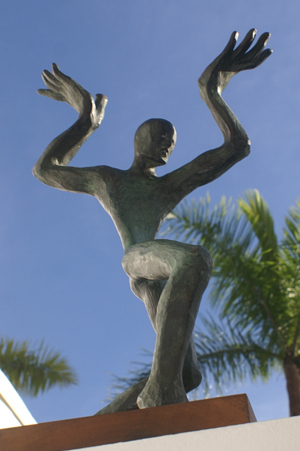 Artwalk spans our Town Center from Vilar Cigar on US 1 and Sunset to the other side of town at the Doc Thomas House, home to the Tropical Audubon Society. Students from local schools entertain our South Miami visitors with musical performances and student artwork is also highlighted as part of the SOMI Sidewalk Showcase. Members of the South Miami Senior High JROTC serve as Artwalk Ambassadors providing information to our visitors. For more information, go to artnightsouthmiami.com. While not happening directly in our business district, the community also celebrates the remembrance of Dr. Martin Luther King, Jr., with festivities during Black History Month in February each year. And of course the community comes together for the annual July 4th Celebration at Palmer Park. Join us in SOMI. 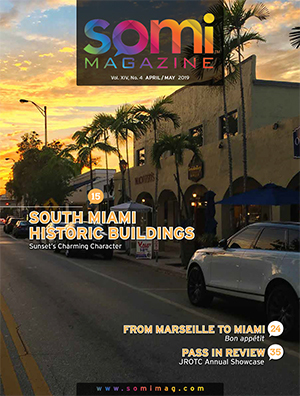 For a small town, South Miami offers a lot of big city amenities, including fabulous year-round events. The annual events produced over these many years would not be possible without the cooperation of the City of South Miami, our area businesses, presenting sponsors, the volunteers from the local chapters of international service organizations and the community-at-large.